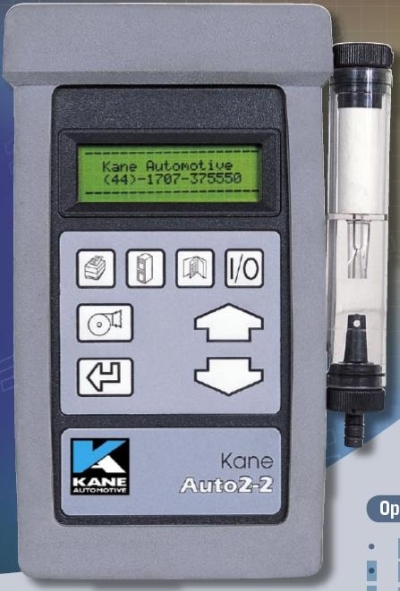 When time is money, Kane offers the Auto 2-2, a truly portable exhaust gas analyser that sets new standards of convenience and ease of use. It weighs just 1.1 kg, fits comfortably in the hand and can run for 4 hours on its internal rechargeable battery. Take the analyser to the car, not the other way round! The infra-red sensing system has been designed by our engineering team and is unique to our products. The four-line display can be backlit. Measurements are shown in real time. Data logging, PC connection or printing via an infra-red printer are all at your fingertips. With accuracy to OIML Class 2, the Auto 2-2 is suitable for regulated testing, where specified, roadside inspection or engine fault diagnosis and tuning. The programmed re-calibration procedure makes service easy and reduces maintenance costs. An automatic leak test can be conducted on every power up. Integral flow checking provides warning of probe blockages. Take the stress out of measuring gas and make it easy with Kane. After all it is all in your hand!